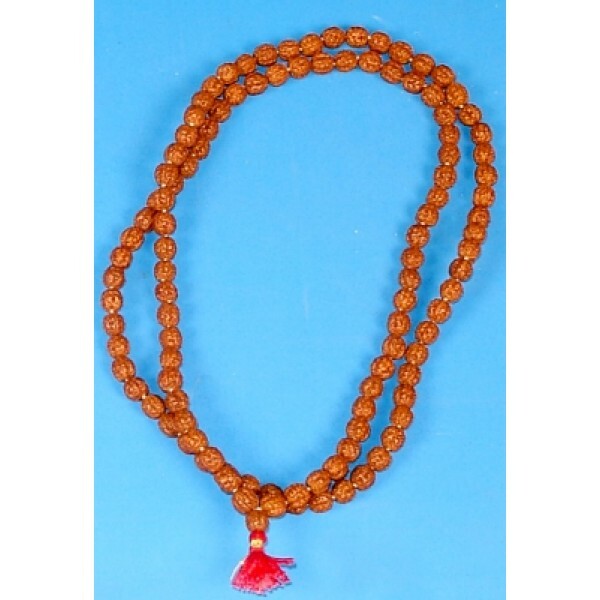 Pure rudraksha mala, 33 inches in length (each bead is around 8 mm thick; the beads are five faced). Total there are 108 beads in the mala (this mala may be used either for japa or for wearing on the neck). Rudraksha malas have traditionally been used by Hindu & Buddhist followers for controlling stress, overall healing, meditation, and engendering positive changes. For thousands of years in India, yogis have worn rudraksha malas to experience the deep tranquility and concentration which are vital for meditation and control of mind and body. The seed of the rudraksha tree (Elaeocarpus granitrus) holds a very special place in Hinduism, and is credited to possess mystical and divine properties. Necklaces made of rudraksha beads are considered auspicious as well as powerful, and are supposed to have profound astrological and health benefits. It is believed that one who wears rudraksha is untouched by sins, and is protected from all impious deeds or thoughts. We sell only 100% pure authentic rudraksha malas of the highest grade. Be very careful of duplicates when purchasing sphatika, rudraksha and tulasi malas.